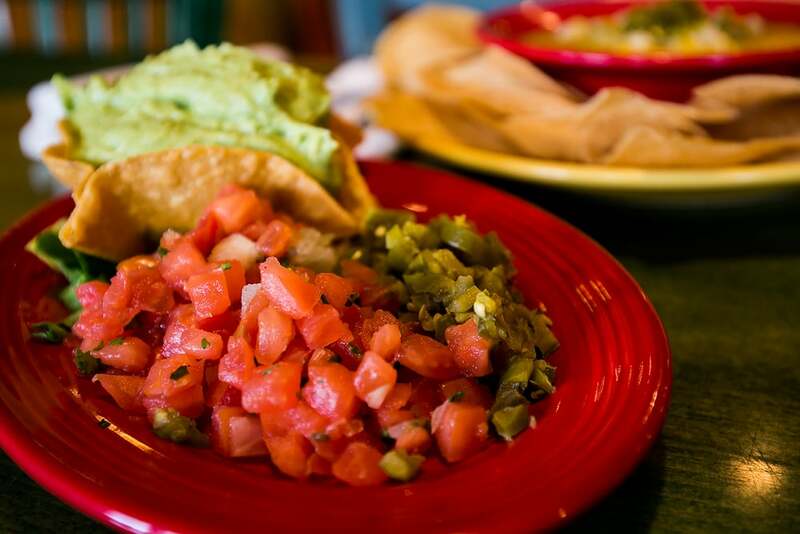 We take as much pride in our food — house-made salsa from a family recipe, guacamole from fresh Hass avocados, fresh-made, vegan, and gluten-free enchilada sauce, verde sauce, black beans, pinto beans, and rice — as we do in our warm, friendly service. $7 / Lg. - $4 / Sm. Made fresh in house throughout the day. Served with shredded lettuce, pico de gallo and pickled jalapeños. Clancy's hand breaded, the Best in Town! Served with horseradish sauce. Fried and served with tangy orange sauce. Shredded chicked wrapped in corn tortillas, deep fried and served with guacomole, pico de gallo, lettuce, sour cream and parmesan cheese. Grilled chicken in ranch dressing, rolled in flour tortillas, add jalapeños for a little kick. Our Shrimp-Stuffed Jalapeños, chopped, mixed with Sour Cream and rolled up in a warm flour tortilla. Six jalapeño peppers stuffed with Oaxaca Cheese, breaded and deep~fried. Served with our Raspberry Chipotle Sauce. Cheddar/Jack cheese, refried beans and jalapeños. CCQ amd refried beans with your choice of beef or shredded chicken, topped with cheddar/jack cheese, pico de gallo, jalapeños and sour cream. Mixed lettuce, pico de gallo, cheddar/jack cheese, chili, diced inions, sour cream and crispy corn tortilla strips, served in a fried tortilla bowl. Mixed greens topped with sautee'd onions and bell peppers, black bean and corn salsa, cheddar/jack cheeses, fajita chicken, pico de gallo, and key lime cilantro cream. Served with a cheese quesadilla and Poblano Ranch Dressing. Flour tortilla filled with Cheddar/Jack cheese, grilled and topped with grilled onion, pico de gallo and sour cream. CAMERONES ~ Grilled Shrimp, saute'ed bell peppers, onions and mushrooms. WIth lettuce, tomato, onion, and a pickle slice. Served with French Fries. Blackened, grilled or fried Mahi topped with Mango salsa and tartar sauce. Grilled chicken, lettuce, pico de gallo, black bean and corn salsa, cheddar/jack cheese with poblano ranch dressing wrapped in a flour tortilla. Served with rice, choice of refried beans or black beans, pico de gallo and sour cream. Corn tortillasm seasoned ground beef, red enchilada sauce, cheddar/jack cheese, chili, and onions. Served with grilled peppers and onions on a sizzling hot skillet! Served with rice and choice of refried beans or black beans, lettuce, pico de gallo, cheddar/jack cheese and sour cream, with warm flour tortillas on the side. Choice of two sides: rice, coconut rice, refried beans, black beans, fries, fried plantains, red potatoes, sautee'd zucchini and squash or Mexican corn. Slow cooked in Dos Equis Beer and grilled over and open flame. Slathered in our spicy homemade chipotle honey BBQ sauce. A house favorite ~ Chicken breast saute'ed in a wine and butter sauce, served with grilled onions, bell peppers, slided tomatoes and sour cream. Your choice of meat with cheddar jack cheese, rolled up in a flour tortilla and deep fried, topped with CCQ. Served with pico de gallo, sour cream, guacamole, rice and choice of beans. All of our Burritos are filled with rice, beans and cheddar/jack cheese and topped with red enchilada sauce, lettuce, pico de gallo and sour cream. Two soft flour or crunchy corn tortillas, served with rice and choice of refried beans or black beans. Choice of shredded chicken or ground beef with lettuce, pico de gallo and cheddar/jack cheese. Shredded cabbage, blackened tuna or mahi, mango salsa. Topped with key line cilantro sour cream. A Clancy's Favorite! Grilled skirt steak rolled in a flour tortills, served with lettuce, pico de gallo, sour cream and guacamole. We mix more than a dozen different margaritas and keep more than 50 different tequilas on our shelves. We also proudly stock and pour a wide variety of domestic, imported and craft beers. A New Smyrna Beach tradition for more than three decades, Clancy's Cantina first opened in the late spring of 1983 in a small storefront in the Indian River Shopping Center on 3rd Avenue. It was the dream of Bill Clancy — who had already retired from a career in the Air Force and then a second career with Lockheed — and his wife Marianne. The restaurant quickly became a local favorite and in late 1984 moved to a larger space in the same shopping center. With larger seating capacity came a full liquor license, and the Clancy's margarita was born. In 2010, Clancy's — now owned by two of Bill and Marianne's 10 children, twins Matt and Margaret — moved into a former neighborhood grocery on Flagler Avenue. With bright, streetfront seating, a covered outdoor patio, and the same famous margaritas, Clancy's soon become an anchor in the vibrant beachside shopping, dining and tourist district. The Cantina's roots, though, go deeper than that — back to 1920s Texas, where Bill Clancy's mother, Margie Clancy Donnelly, began cooking her own style of Texas-influenced Mexican food to help pay the bills while her husband, Robert Clancy, a wildcat oilman, was away at the oilfields. After Robert's death, Margie married Blackie Donnelly, a former Texas Ranger, and the two moved in 1935 to Little Rock, Arkansas, where they opened Mexico Chiquito using the recipes Margie had developed during her years in southern Texas. The restaurant is still in business today and still known, just like Clancy's Cantina, for Margie's special chile con queso, legitimately believed to be the origin of the Tex-Mex queso dips now found on the menu of virtually every Mexican restaurant in America. Follow Clancy's Cantina on Instagram for Special, News and Events! Visit Cafe' Verde right behind Clancy's!